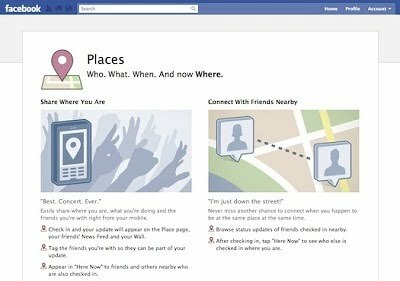 This past Thursday, Facebook introduced a new feature called Facebook Places, basically a ripoff of Foursquare in which users "check in" to businesses, restaurants, homes, train stations, etc etc etc. Because, you know, we don't stalk each other enough. One of Facebook Places' more unnerving features is that friends can check you in without your permission. So let's say you decline on a party invitation because you are "exhausted" or "have a family event" and then, oops!, your friend checks you in at your favorite bar. Of course, you shouldn't have lied, you sneak, but there are hundreds of other scenarios in which you might prefer to keep your whereabouts private, thank you very much. Don't fret, dear readers, there is a way to fix this infringement on your privacy! First, log in to your Facebook account and go to the Privacy Settings section. Click on "Customize settings." Scroll down to "Things Others Share" and change the "Friends can check me in to Places" option to Disabled. And, voila!, you can continue to lie about your whereabouts to your so called friends. Are you wondering how we got into this whole Facebook mess in the first place? Don't forget to check out the trailer for the upcoming movie The Social Network.